Soon you may be able to chat with strangers within your Facebook Messenger apps as it's rumored the service will be opening public chat rooms in the near future. TechCrunch has found mentions of public chats within Messenger's code, which includes a logo and a description of the service. The description reads, "Rooms are for public conversations about topics and interests. Each room has a link that can be shared so anyone on Messenger can join the conversation." A number of TechCrunch readers found they were already able to launch chat rooms with both friends and strangers as well as a number of sharing features which aren't available in normal Messenger. It's not the first time Facebook has experimented with chat rooms. 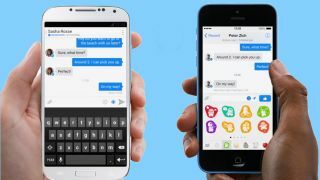 In October 2014, Facebook released its Rooms app for group messaging. Rooms was shut down last December. The reason was rumored to be the app wasn't performing well enough. The service showcased the good and bad sides of open chat rooms - especially as you didn't need to sign up with your real name - but it wasn't an app many wanted to download separately. Bringing this functionality into the Messenger app will make it a lot more accessible for the 900 million plus users of the platform. When asked to comment, Facebook told TechCrunch, "We often run small tests - nothing more to share beyond that." Public chat rooms within Messenger may never happen though – we'll have to wait for an official announcement from Facebook. In the meantime, there are always the chatbot applications.